A large house on two levels, each one divided into an open-plan, studio apartment with kitchen and bathroom, along with shared garden filled with flowers and coffee trees. 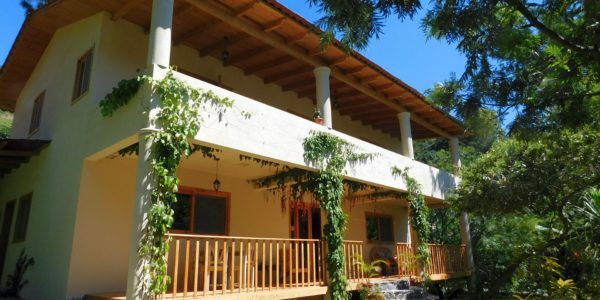 Situated in the prime location of Paxanax Bay, Santa Cruz, Lake Atitlan, one of the most sought-after areas of Atitlan. Currently part of a larger property with another house in front and it can be bought with this second house (click here for more information). The apartment on the lower level has the front terrace area as a private space. There is a toilet to one side and the shower is under the external staircase to the second level apartment. On the second level is another open-plan, very light apartment with kitchen and interior bathroom and a balcony. 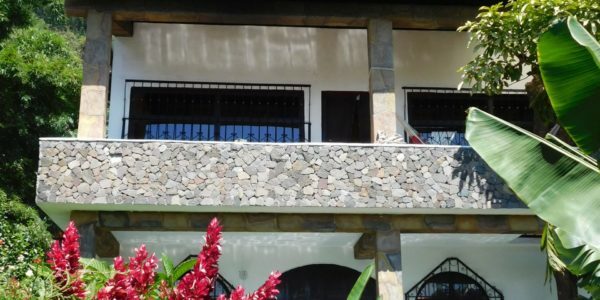 The whole apartment has fabulous views of Lake Atitlan. There is a large bodega in the garden, shared by both apartments. Water is pumped from the Lake and goes through a sophisticated filtration system. Electricity is from the national grid.